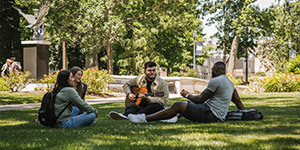 Monmouth University provides its students with a dynamic and varied academic environment where there are abundant opportunities to learn, adapt, and grow both personally and professionally. 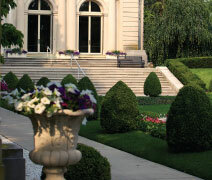 Colleges, Programs, and Degrees: Monmouth offers 32 undergraduate programs and 23 graduate programs under six schools: Leon Hess Business School (AACSB accredited), School of Education, School of Humanities and Social Sciences, School of Nursing and Health Studies, School of Science, and School of Social Work. * Includes books, personal expenses, summer, etc. Financial Aid: Academic achievement–based scholarships are available to those who qualify. Undergraduate students are considered for Monmouth’s academic excellence awards at the point of admission to the University. Graduate scholarships are also available for students entering most programs and are based on a student’s undergraduate GPA and the number of credits taken each semester. We also offer graduate assistantship opportunities to qualifying students as graduate assistants, graduate teaching assistants, and graduate research assistants. These positions can cover up to nine credits of tuition per semester. Test Score Requirements: Applicants whose native language is not English must meet English proficiency requirements and have the official results sent directly from the testing center to Monmouth University (code 2416). For English proficiency options, please visit the University website at monmouth.edu/international. 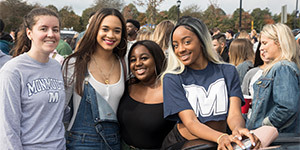 Monmouth University provides its students with a dynamic and varied academic environment where there are abundant opportunities to learn, adapt, and grow both personally and professionally. Small classes—which allow for individual attention and student-faculty dialogue— and purposeful academic advising are hallmarks of the Monmouth experience. The University’s curriculum is in touch with today’s globally oriented technological society and offers challenging and innovative degree programs that interface with social and political issues. Monmouth requires all undergraduate students to fulfill an experiential education component, a real-world experience related to the student’s interests. Monmouth offers graduate programs that are relevant to today’s workforce needs. Eligible students may also enroll in a five-year baccalaureate/master’s program that allows students to complete both an undergraduate and graduate degree in certain majors in just five years.